Unless you were under a rock and off the internet this week (no shame, self care, you do you, I'm jealous, etc. ), you have probably seen the furious debate about the true and legitimate meaning behind the acronym IMHO. It's a fight for the ages! 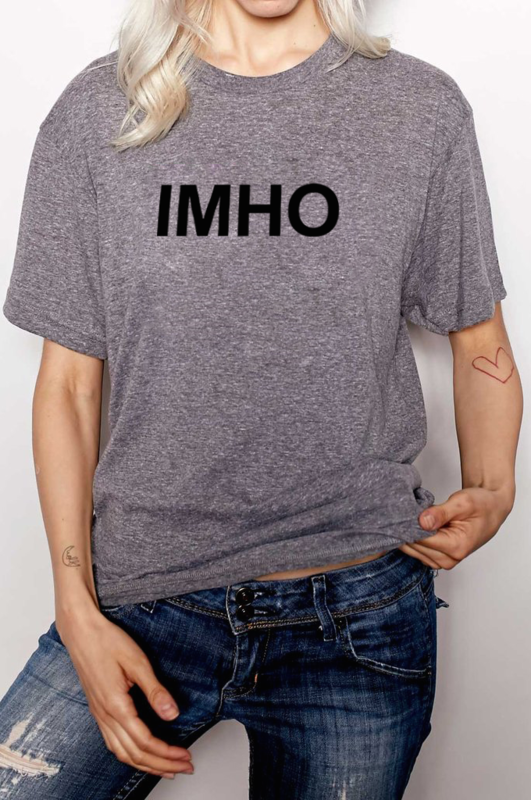 Why are people debating what “imho” means? It’s obviously humble. Why would someone say “in my HONEST opinion”? That’s stupid. You’re all being stupid. People are frankly going off the damn rails. And because us lovable scoundrels at BuzzFeed are fond of stunts, milking cultural moments, and bringing online debates into the real world, we did a thing! It's kind of a joke! But it's also very, very real. You can put your money where your opinion is and let everyone know which side of history (ANOTHER H!!!) you are on. Be HONEST, you need this. Be HUMBLE, yet know you are correct. And the best part is: whichever version sells the most will automatically become the correct definition forevermore, on Urban Dictionary and in the annals of the internet. Get yourself a piece of history and never stop fighting for what you believe in!!! Find all three versions of our Great Debate merch here. Be H: do you care enough about this to give us* $23? *We promise to use it to keep making content that dismantles your whole sense of reality.